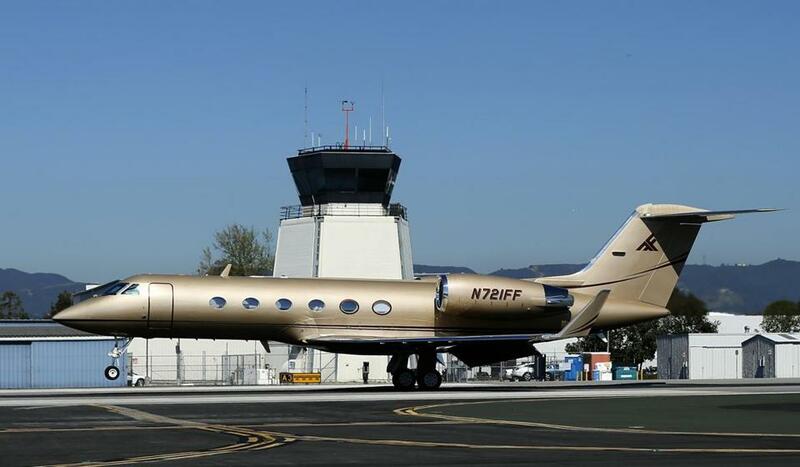 A Gulfstream Aerospace G-IV aircraft landed in front of the air traffic control tower at Santa Monica airport in California. Private jets, chauffeurs, financial planning services, Red Sox tickets. Executive perquisites are still alive and well at many public companies, even after a decade of intense shareholder scrutiny. While many corporate boards have trimmed perks, a handful of choice benefits still remain luxury fixtures in the corner office. These perks typically come to light this time each year, when public companies file shareholder proxy statements that disclose the information. A review of recent filings shows that personal use of company aircraft remains popular. For example, EMC Corp.’s chief executive, Joseph Tucci, took home not just more than $16 million last year in cash, stock and incentives; he also received $113,545 in side benefits of the job, including private jet travel, the services of a financial planner, and a special medical exam for executives. Some firms have taken to limiting their chief executives to $100,000 of paid private jet use, which is about 20 hours, depending on the size of the plane, or roughly the equivalent of two cross-country trips. At Boston Scientific Corp., chief executive Michael Mahoney recorded $71,853 of allowed personal use of the aircraft. “There are still definitely companies that give out a number of things — things that are actually very expensive and questionable,’’ said David Eaton, a vice president at Glass, Lewis & Co., a San Francisco firm that advises large investors on how to vote on shareholder matters. And with perquisites generally on the decline, he said, compensation committees are feeling more pressure to justify certain expenses. Many of the reported perks are small relative to executives’ total compensation. Indeed, the modest amounts are what make some of them stand out. For instance, virtually every chief executive (and often the entire top rung of managers at large companies) gets annual medical screenings, head-to-toe exams that cost from $2,000 to $3,000 each. 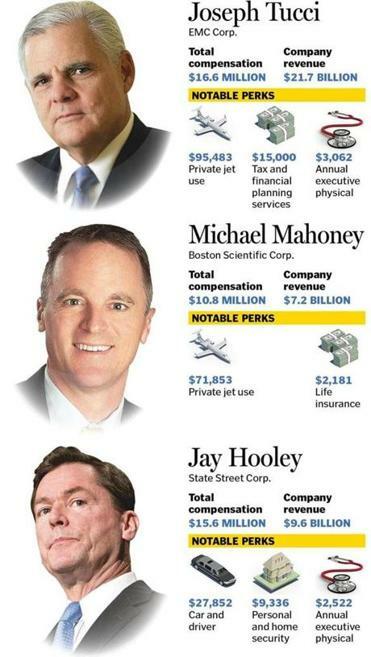 At State Street Corp., shareholders paid $2,522 each for doctor appointments covering all five of the top-paid executives at the Boston financial services company. State Street says its general practice is to cover preventive care for all employees. State Street chief executive Jay Hooley, who took home $15.6 million last year, also had a car and driver, a perk worth $27,852, and received $9,336 for personal and home security. Both are benefits typical of major Wall Street firms, which say they are necessary to keep top executives safe. While these items are likely small benefits to executives with multimillion-dollar pay packages, they can look like luxuries to average workers. For instance, at Dunkin’ Donuts parent Dunkin’ Brands Group, chief executive Nigel Travis and other top executives each got $2,160 worth of Red Sox tickets last year. In Travis’s case, that was down from $12,123 the prior year, when the top brass also received “flexible allowances” along with sports tickets. At LPL Financial Holdings Inc., a Boston-based network of brokers, shareholders covered $1,479 in brokerage commissions for chief executive Mark Casady. He also got $28,169 for his car lease, as part of a $4.7 million total pay package. At PerkinElmer Inc., a Waltham maker of medical and environmental products, chief executive Robert Friel made $10.8 million last year. His perks included a $25,000 car allowance, $20,000 for a financial planner, and a $50,000 donation by the company to match gifts of his own. Compensation specialists say some of these perks are relics of a time gone by, when executives had long lists of special benefits, along with massive exit pay packages when they retired or sold their companies. These days, boards are looking for directors with especially strong backbones to serve on their compensation committees and take a harder look at pay and perks. Still, these benefits are not easy to take away. In recent years, many proxies have featured a list of perks and pay areas that directors chose to curtail. At Perkin­Elmer, for instance, the board has eliminated a special concierge health care benefit for executives, and it has stopped making “gross-up payments” to cover the added taxes that come with executive perks and compensation, a practice that has been sharply criticized by shareholder advocates. PerkinElmer, in a statement, said it provides a “limited number of personal benefits to eligible company officers,” to remain competitive to attract and retain senior executives. Affiliated Managers Group Inc., a large investment company based in Beverly, has not yet released its new proxy. In 2011, the company embraced aircraft benefits and other perks. But the board decided to stop paying executives to hire their own financial planners.